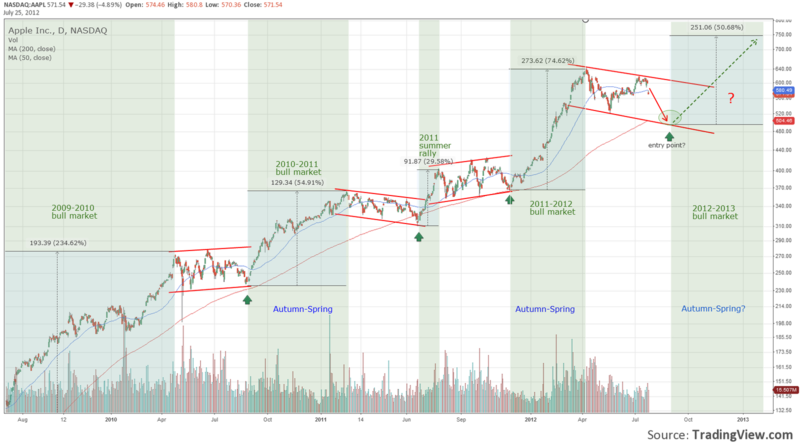 Following post analyses, the seasonal share move in Apple stock and tries to extract repeating and often occurring relationships between the season and the share price trend. 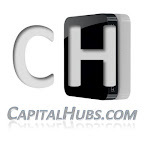 Seasonality in capital markets is very common. Apple proved to follow strict seasonal patterns. Daily charts from mid-2009 indicate that there are two repeating patterns every year since 2009. The first is a bullish market which usually starts during autumn (September-November) and lasts until spring (April). The second is a consolidation period, which occurs in summer months. This relationship has been extremely strong for the observed period. Bull periods are strong with gain above 50%. The first one started with the broad bull market rally, which for Apple means 234% gain. The second rally, between 2010-2011, started in September and added 55% to the company market cap. Autumn 2011-Spring 2012 rally started end of November 2011 and added 75% return. 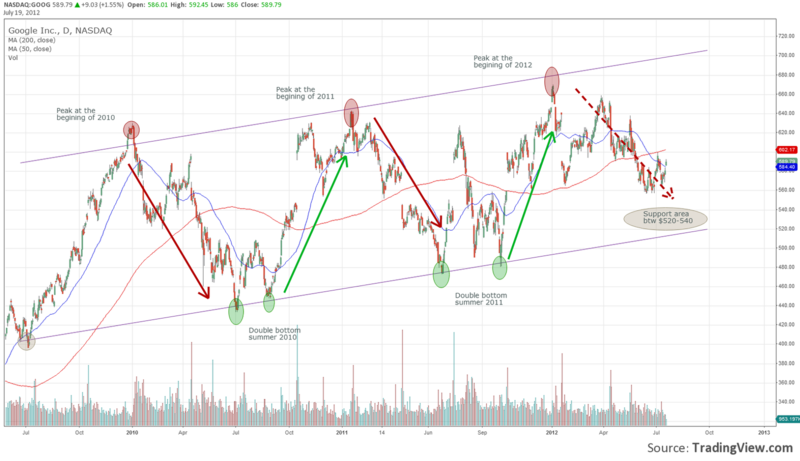 During the summer months, the AAPL stock corrects, however that pullback is not severe and it resembles horizontal consolidation, same as the one of the 2010 summer. Summer 2011 was slightly different as the bull market ended earlier (February), thus it was longer, followed by a sharp rise in Jun-July and another horizontal consolidation until November. The last bull market started in November 2011 and continued until April 2012. Since then, we are in a period of consolidation/correction. 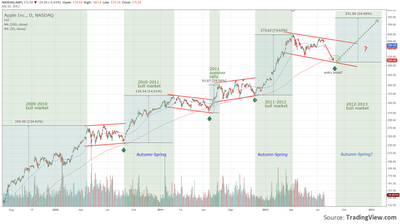 If above mentioned patterns are to be repeated again, we could expect current correction end in autumn 2012 (Sep-Nov period). This means start of new bull market with entry point $500-$530, determined by the parallel channel support line and 200 day moving average cross point. 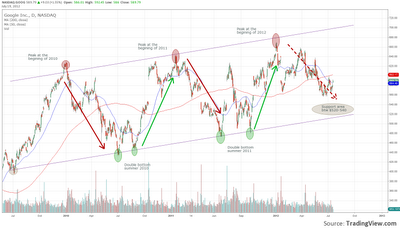 History has proved that whenever AAPL price touches the 200 day MA the buy signal is indicated. If we assume 50% gain, the target price is $750. Note: The char is in log scale. As practice proved it it’s always been good strategy to buy quality blue chip companies on dip. Now is the moment to consider Apple as recent share drop is opportunity to jump in. Falling iPhone sales seem reasonable before debut of the new iPhone5 as customers wait to get the new product. This should not be a constant threat since Apple is a company continuously providing product diversification which protects its leading status. The new iPhone5, the iPad mini and the rumored Apple TV are expected to further strengthen its revenue growth. 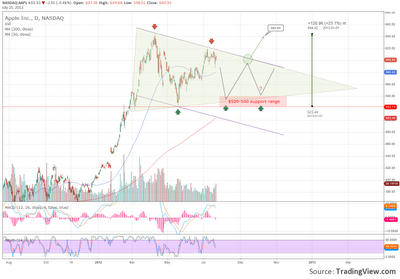 According to the technical analysis the support range appears to be $520-540. 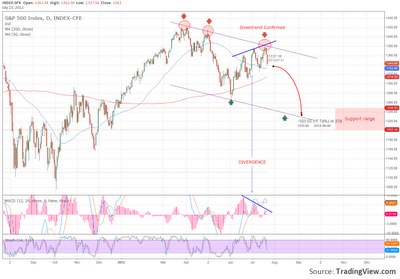 That is the area close to triangle support line and projected 200 day moving average, both strong support levels. It is questionable whether investors would let AAPL stock touch those levels thus price under 560 is acceptable. The short term target is $642, the April peak. Summer rally proved to be short lived and without volume support as most of the public is out for a vacation. However the markets don’t go to summer holidays and we are witnessing that consequence at the moment. Recent rally was undermined by numerous factors. First, disappointing Chinese growth data sent markets south, second newly refreshed Euro skepticism over debt problems resolution have led to brief selloffs. On the technical side the S&P500 index (SPX on the chart) is showing really disturbing signals lately. First to mention is the fact that we got fresh new lower highs, which suggests negative trend formation. Another worrying fact is the divergence between the index and the histogram of the moving average convergence divergence (MACD) indicator. 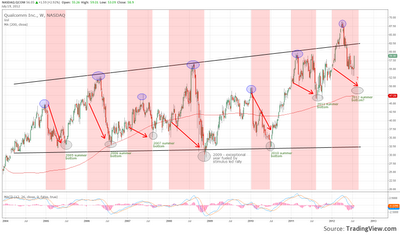 This point to trend reversal and, as history shows, it is seldom wrong. How deep could markets drop? Based on the previous bottom registered at beginning of June and latest peaks we have built parallel channel pointing the bear move. Using 2011 bottoms as reference the support range between 1200 and 1240 is the target area, some 6 to 10% drop. However if there is strong monetary or political sign for support the markets could find ground and rally briefly. For trend reversal we would need more persistent policy action. 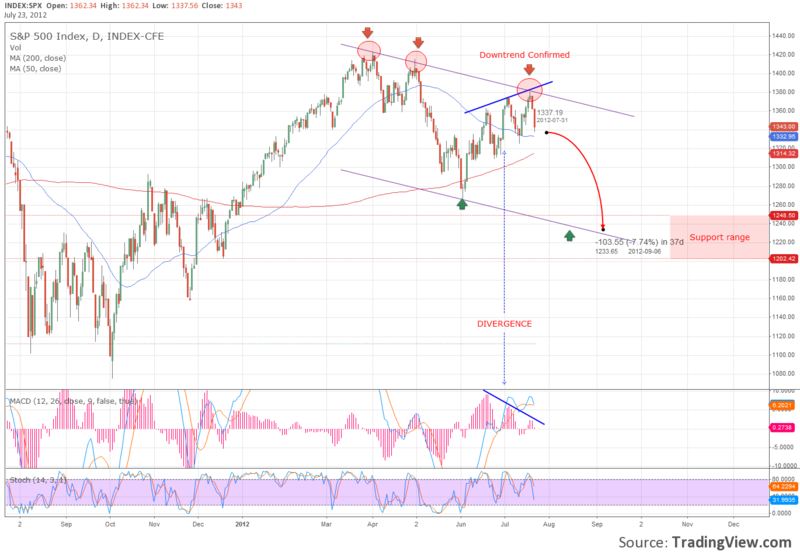 Based on current unfavorable macro environment, which suggests sluggish growth worldwide, and mentioned technical indicators we could say that new bear market is knocking on the door. Breakthrough of the parallel channel confirmed the bearish trend of the silver. The precious metal tried to reverse last two months but growing concern over China (demand) has pressured the price further. Still SLV is trading within the long term triangle consolidation. If we see breakthrough of the triangle resistance line (another bearish sign) levels of $22.40 and $19 could be seen. If, however, markets reverse and risk appetite returns to investors mind a possible breakthrough above triangle resistance at $29 (which will eventually coincide with 200 MA) could drive the price 26% higher to $38. 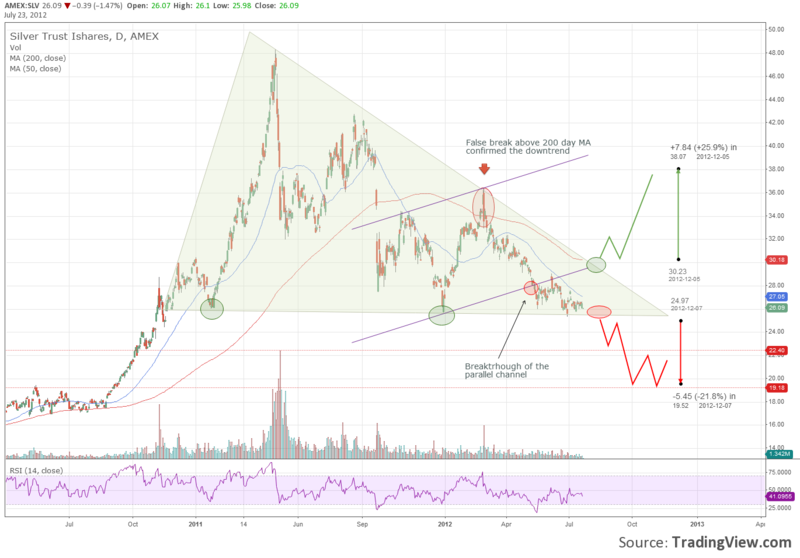 In post published five months ago I set target for Google considering the seasonal deviations and repeating patterns of the stock. 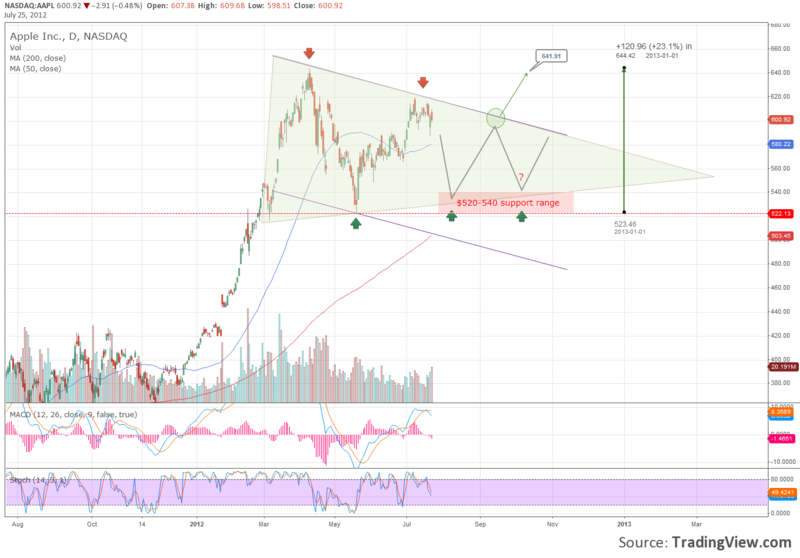 Now the analysis proved to be consistent and Google reached $557 in late June. Still the target stays intact, however if broad market rally occurs we could easily see the tech giant trading above its 200 moving average ($602). 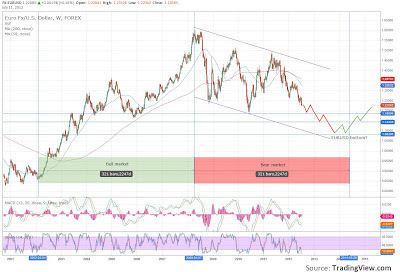 EURUSD has been falling since the beginning of 2008 with bear market clearly seen on the chart. Recently intensified European problems threaten single currency dive down to new multiyear lows. With problems still deepening and slow decision making the rise of the euro seem to be postponed. Ten year chart of EURUSD shows two cycle pattern. The bullish market, which started 2002, lasted 6 years. The peak was formed in 2008 when the crisis erupted. If we assume that the bear market would be with the same duration as bullish one the end of this cycle could be dated at the end of 2013 or the beginning of 2014 with target 1.08. Of course such assumption is based on approximation as the strength of the euro strongly depends on the ability of the Euro leaders to manage the situation. Moreover considering the fact that world growth is slowing additional stimulus form central banks is expected. Although opposing it for now FED could be pushed for another round of quantitative easing if unemployment stays at elevated levels and GDP growth slows below 2%. In that line of thoughts not the dollar is strong but the euro is weak and that is what has been driving the EURUSD exchange rate over last 3 years. EURUSD target for 2013 end is in the 1.05-1.15 area however the pair has to overcome some important support levels at 1.1870 and 1.1440 – both 2003 lows.